I got in to San Francisco on Tuesday afternoon following a lovely flight. I had accumulated a sufficiently large number of miles thanks to traveling a great deal for my former employer, and decided to cut the final cord by cashing in these miles to make the flight from West Palm Beach (Florida) to San Francisco sitting in the relative comfort of the first class cabin. Frankly, the seats, wide and recliney as they were, were still somewhat uncomfortable on a long cross-country flight. Like a lot of American males, I suffer from a severe lack of fat cells in my posterior region (think Hank Hill from the cartoon King of the Hill), so I lack the necessary cushioning for extended seating. Instead, all the fat cells that should have been in the posterior are in my expansive belly, but that is clearly too much information. But this was supposed to be a blog about Macworld, no? Later Tuesday evening, I met up with MyMac.com staffers Mark Rudd, my brother Guy Serle, Macworld | iWorld first-timer Tom Schmidt, Sam Levin, and fearless leader Tim Robertson. We did dinner (and drinks!) at a charming Irish pub down the street from our hotel, discussed what we were going to do the next day, and then retired to the hotel to nurse our jet-lagged wounds and prepare for the next day’s battle. Wednesday morning marked our trek to MyMac.com Central, Mel’s Diner, just around the corner from the Moscone Center, site of the Macworld | iWorld extravaganza—the reason we were all here. 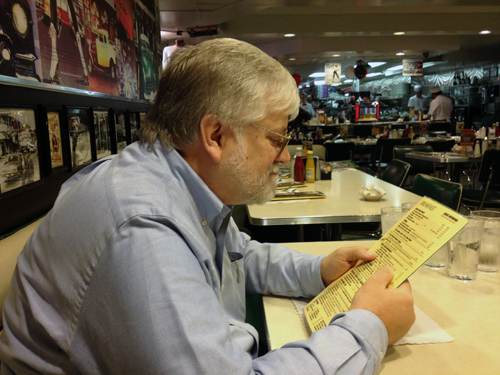 Breakfast at Mel’s was, as usual, delightful and inexpensive. We traipsed over to the Moscone Center, West Hall, and picked up our media credentials, after which, we explored the hall a bit, and then split up for a few hours. I joined up with Tom Schmidt, a technician with an independent Apple Solutions store in the Minneapolis area. He wanted to visit a local independent Apple Solutions store, to see how others do it, as well as share some war stories with the store owner. After a brisk walk back to the Moscone Center, we joined the crew for the annual MyMac.com meetup at noon. As it turned out, we only met a few folks, including Macworld Magazine Senior Editor and noted keyboard tickler Chris Breen, who stuck around while we shared in the serenades of one of San Francisco’s more colorful street evangelists, who spewed an unintelligible and heavily accented “sermon” through a portable amplified megaphone. Chris left when we were then serenaded by one of the equally colorful San Francisco street people, who shared an spirited and enthusiastic version of the Otis Redding classic, Sitting on the Dock on the Bay. After an hour or so, we decided no one else was going to show up and headed for lunch. It was on the walk to lunch that we joined up with San Francisco local and MyMac.com staffer Vicki Stokes, who fit right in with the rest of us rough-around-the-edges Mac geeks. After deciding to save another session at Mel’s Diner for another time, we discovered a really fantastic and incredibly overcrowded Mexican restaurant that served up the real thing—no Taco Bell this. I enjoyed a generously-portioned Fajita which I washed down with a Mexican Coca-Cola (sweetened with real cane sugar instead of the more common high fructose corn syrup). Sated, we returned to Moscone West, and at 3PM, trudged down the hall to the Media Center, where lukewarm Starbucks Coffee and soft drinks awaited. We also met up with MyMac.com legend John Nemerovski (Nemo to you), who had just flown in from Tucson. We recorded the first MyMac.com podcast of the Expo, and waited for the 5PM opening media event, which included drinks and gourmet fare. A select number of vendors (read that: the ones who paid for the event) set up tables and braced themselves for the onslaught of overfed, drunken international journalists looking for convention schwag. But I exaggerate—really! It gave me an opportunity to speak to a number of suppliers of things Macintosh, who were showing interesting new products. Sam Levin dropped by to hand out some really nice STM MyMac/App Minute backpacks that required Tim to forcefully block the surging crowds of those same overfed, drunken international journalists who saw our new backpacks as convention schwag. Among the vendors displaying their wares included the folks from Parallels, showing their latest (new and improved!) version, several iDevice accessory makers, Fujitsu’s new line of ScanSnap products, a novel product, Mac in Minutes for Moka Five Suite, used to deploy MS Windows desktops to Macs in a fully-managed enterprise environment, and the $150 xPrintServer from Lantronix, which could be the solution you’re looking for to print files from your iDevices to any printer on your network. By 7PM, we were all pretty well tuckered out, and headed back to our respective hotels, so as to prepare for the real day one, when the main expo floor opens on Thursday.